Knowing how to break down your project into simple steps is the secret to success! How many times have you written something down in your planner only to rewrite it the next day, and the one after … I know what that’s like too. Disheartening. The excitement wains + before long you are left wondering if it’s really worth it. Whether it’s saving for an overseas holiday or cleaning out the garage, it’s possible to see your dream become a reality. Knowing how to break down your project into simple steps is the secret to success. Projects are multi-tasked. Which simply means projects are made up of many individual tasks. And it’s in completing these simple actionable tasks that make achieving your project possible. So how do you break down your project and actually complete it? When planning a project create an action plan based on the SMART goal criteria. 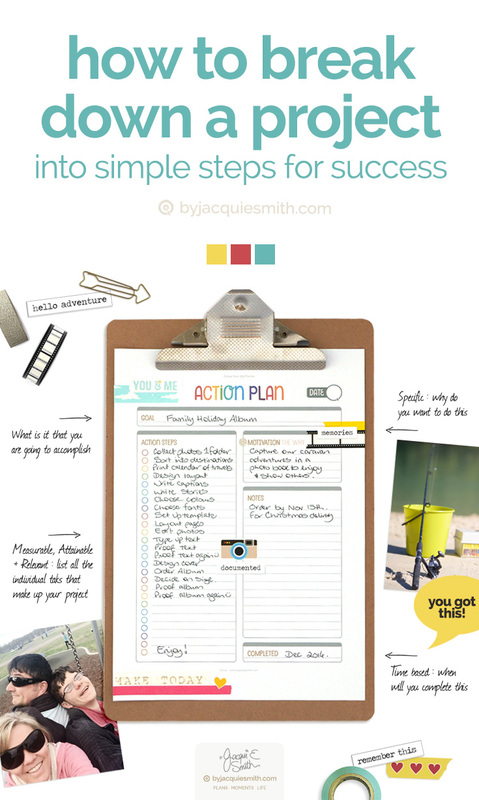 With a SMART action plan you can easily break down a project into simple steps. I do this by listing all of tasks that need to be done to complete the project. I set a date I’d like to achieve it by. I am clear about why I am doing this project, what it is for + I have a built in way to measure progress and stay focused on getting things done. When you have a SMART action plan you can get a better idea on how long a project will take + it helps you to not over commit. You can block out project time in your calendar to work through the tasks in your action plan. Marking off tasks as you complete them makes it easy to see where your up to + how far you have to go. Instead of scheduling individual tasks in my calendar I block out chunks of time to work on my project. As a work-at-home-schooling mum I felt like I spent more time adjusting my calendar when days didn’t go according to plan, than getting thing done. When I finish that time block I log what I worked on in my calendar so I can see how long things took for next time + it makes invoicing clients a cinch. It also serves as a log for memory keeping. This could just as easily be done on paper too. I have a stack of old diaries from before I “went digital”, not decorated with beautiful washi or stickers we have today. But with so much already in my Calendar I find it’s easy to keep it all in one place. Batching like tasks together works well for my productivity style. I set my days and weeks to have a theme within the project. I’m more productive with a wider scope + freedom rather than a rigid daily routine. Life is not one long todo list, it’s to be enjoyed too. As a self confessed planner + organiser I need to make sure I’m taking care of myself by not over committing so that I can enjoy life with those I love. 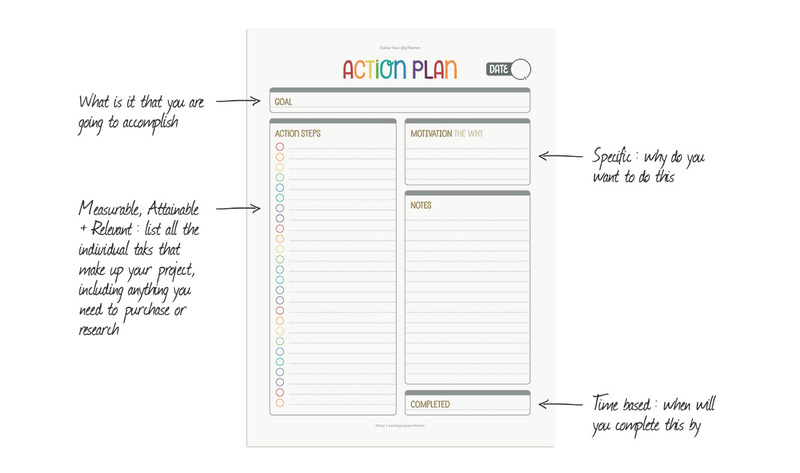 By using the Action Plan printable I can see where I’m up to with my project I find it easier to take time out for fun. However you go about doing those individual tasks of your project, your success begins with making a plan. So let’s dive in + break down your project into simple steps for success. This series on Getting Things Done covers five key categories : events, goals, notes, projects + stuff. No matter how we go about getting things done, there are three things we do with everything that comes in, we “ collect # reflect > connect. These three simple steps are what I call FUSE:life because it’s what we are doing when we blend together different pieces of our life into something meaningful, and ideally, a life we love. 1. ” Collect : following the SMART plan + write down the details. Specific – Write down what you want to do + why. Measurable – Write out all the small tasks that make up your project. Checking these tasks off is how you will know that you are making progress + how much you have to go to complete your project. Attainable – By listing all the tasks you will know exactly what you need to do, where you may need to ask for help or what you need to learn about. Relevant – Listing all the tasks of your project you will be able to avoid getting distracted. Time Based – With all the tasks listed you will be able to make a realistic deadline for your project + know exactly what you need to schedule time for. 2. # Reflect : next you go over your project notes + consider the following questions as you get ready to begin your project. 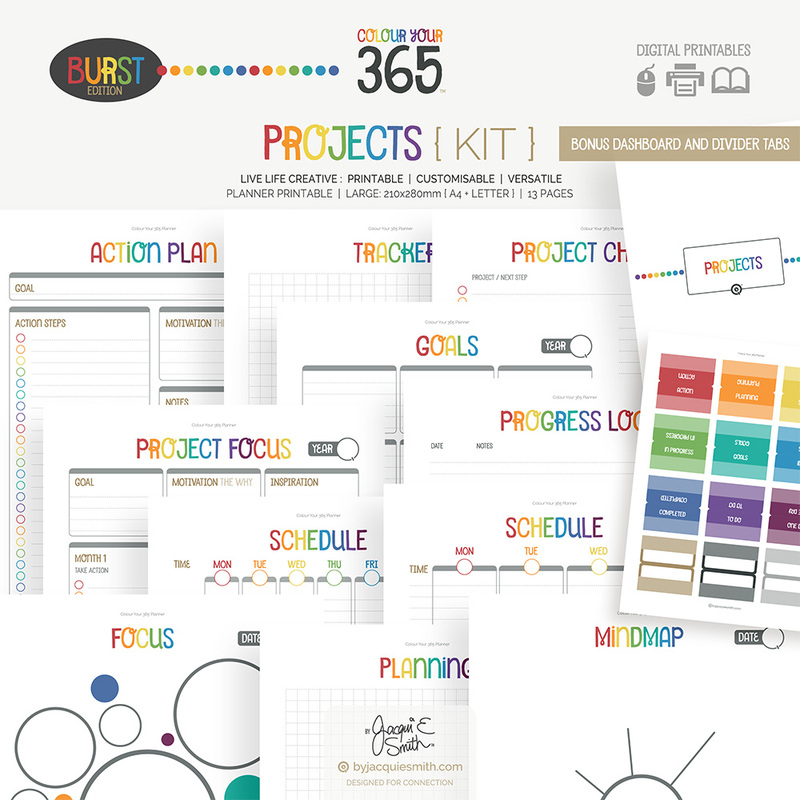 Do you have all the resources you need to complete your project? How much time each day, week or month do you need to schedule to be able to complete it by your deadline? Who else is involved in your project and are they able to participate? Are you going to use a digital or paper calendar for planning out your tasks? What tasks are you able to batch together? Are there some tasks that can be automated? How often will you review your progress on your project? Modify your action plan if needed. 3. > Connect : this is the fun bit where you get to dive in + start your project. You may like to number your tasks in order on your Action Plan or group them for batching like tasks together. No matter whether you are using paper or a digital app, it’s time to schedule your tasks in your calendar, either on a daily or weekly basis to make consistent progress toward completing your project. Having your Action Plan master list help to keep track of your progress, despite what happens on your calendar. Some days just don’t go to plan. Don’t worry, just keep on going tomorrow. For tips on getting things done, check out the articles Secret for ToDo List Success and How Not to Get Stuck in the Planning Phase. This is great! Can’t wait to use these steps. You’re welcome Leslie. It’s such a great sense of accomplishment when projects are completed. Enjoy!